Vitalizes. Smoothes the skin. Non-greasy. Refreshes tired legs. Vitalizes, Smoothes skin, Non-greasy and Refreshes tired legs. 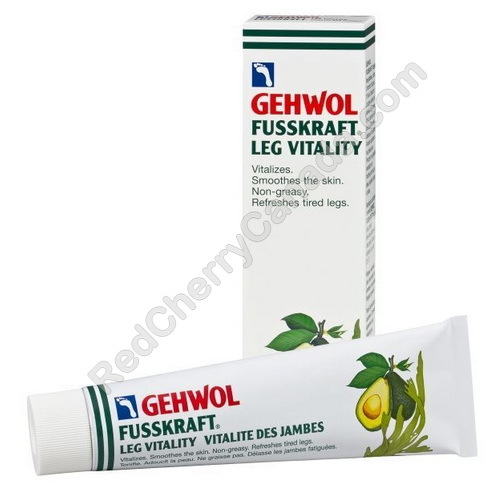 Fusskraft Leg Vitality is a balm for the special daily care of legs and feet. It is quickly absorbed, pleasantly refreshing, and makes your skin beautiful. Precious avocado oil, algae extracts, and vitamin E provide the special skin-friendly properties of Leg Vitality. Problem zones with dry and scaly skin are prevented; the moisture balance of the skin is considerably improved. Allantoin and the chamomile component bisabolene support the caring properties and strengthen the mildly deodorising effect of the herbal agents. Hamamelis - an extract from the Virginian witch hazel bush - soothes irritation and prevents wrinkles.